Forum Home > Bend it, Mend it - Mods & Wreckers > Louis' 7A38-7069 Repair..
To recap , I just got this 7A38-7069 that was advertised as in need of repair . I installed a new 394 battery and the only thing it does is reset the large chrono second hand when I pull the crown 1 click and push button C for two secs. I am using You Tube "7A48-7000 tear down" as a guide . So far the only thing I can see is discolorization on the bottom of the antimagnetic plate and the top of the circuit block .....every thing looks clean as a whistle . The green insulator plate is looking clean and no sign of rust or any corrosion anywhere . I am cleaning up the plate and block and think I will reassemble everything and see what happens . I have not touched the 4 little coils or removed any other components after the green insulator . 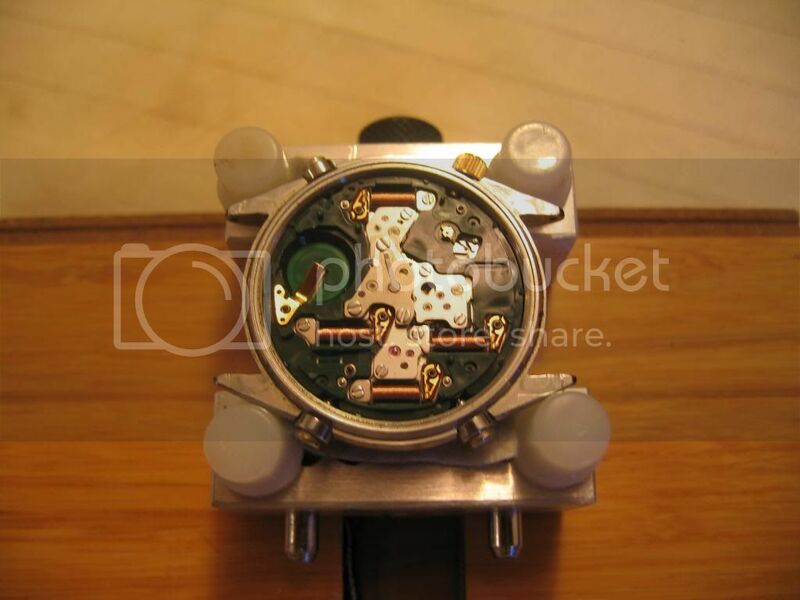 If I do need to locate parts I would trully appreciate it if someone could steer me in the right direction...as a matter of fact I would like to know where I could purchase parts for this or my other Seikos anyway . I also have another 7A38-7069 that works great . but that 'discolorization' may be the cause of all your problems. The watch has obviously suffered from a leaking old battery at some point. How much damage is done when this happens can vary tremendously, depending on the battery make, length of time it's left in there and the path that the escaping fluids follow. Simon (Sir Alan) and myself have encountered a good number of 7Axx's which have suffered similarly - and the PCB looked OK-ish, to the naked eye - some almost pristine, but were in fact as dead as a dodo. If you had posted a photo of the underside of the anti-magnetic back-plate, it might have given us a better idea. I'd suggest having a good close look at the tracks on the back of that PCB, under a loupe or magnifier - there may be bare tracks shorting against the underside of the back-plate. 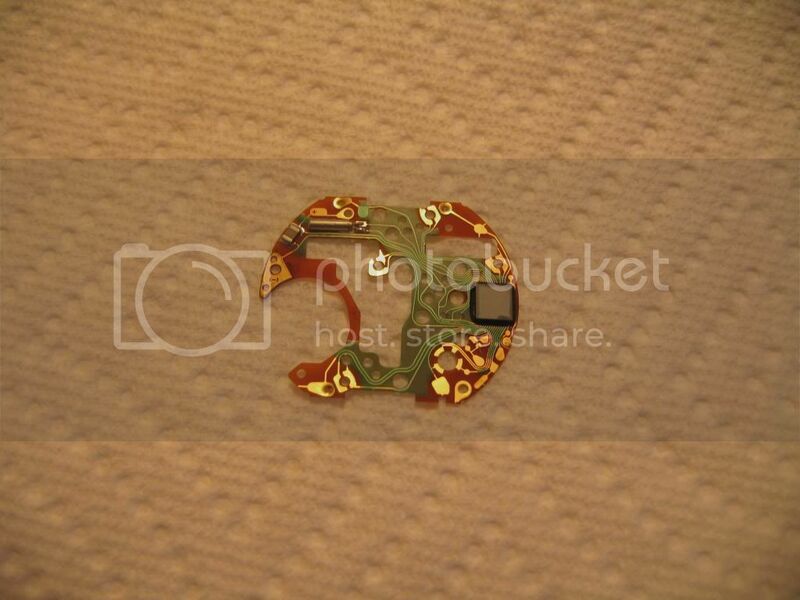 My first tip would be to try the good PCB off your working 7A38-7069 on that partially working movement. By the way, Louis - I did post a link to this thread about a 'DOA' 7A28-7120 at the bottom of page 1 of Tim's recent 7A28-7049 thread. 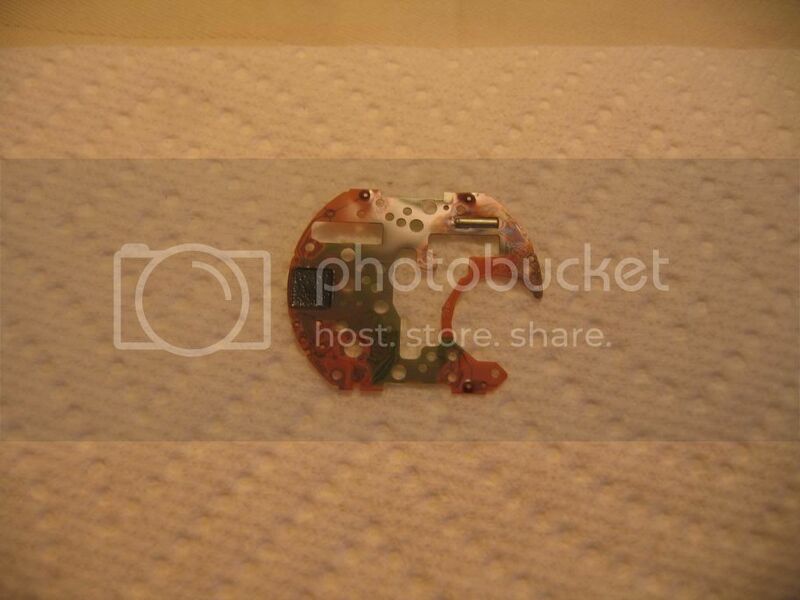 You might want to check out Christian's photos of PCB and underside of anti-magnetic back-plate in that thread and compare. 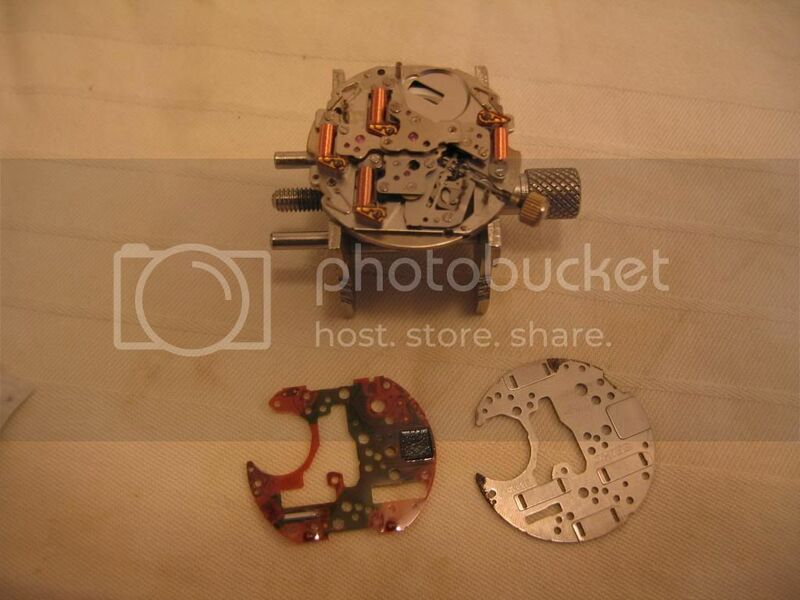 Thanks , I reassembled the watch and tried it again . I found that the large chrono second hand [only] , does a reset when I install the battery on the first click , pull the crown to the second click , then push the crown all the way in....not in the reset mode as I stated earlier . Also the normal seconds sub dial will work if I fiddle wiith the crown when it's all the way in to normal position . I have read other posts on the adjustment of the Changeover Switch Lever and think that may be the problem that is inhibiting proper operation of all funtions ?? Also , does any one have any Info on the small Gold Regulator ? I'll reply to the remainder of your questions tomorrow morning (my time). Louis. I just re-read what you'd written in your last post. So you re-assembled it using all the same components ? You didn't try the known good PCB from your other working 7A38-7069 in it, as I suggested ? No I did not , I bought the second watch as a donor and a good place to learn the inner workings of this watch . 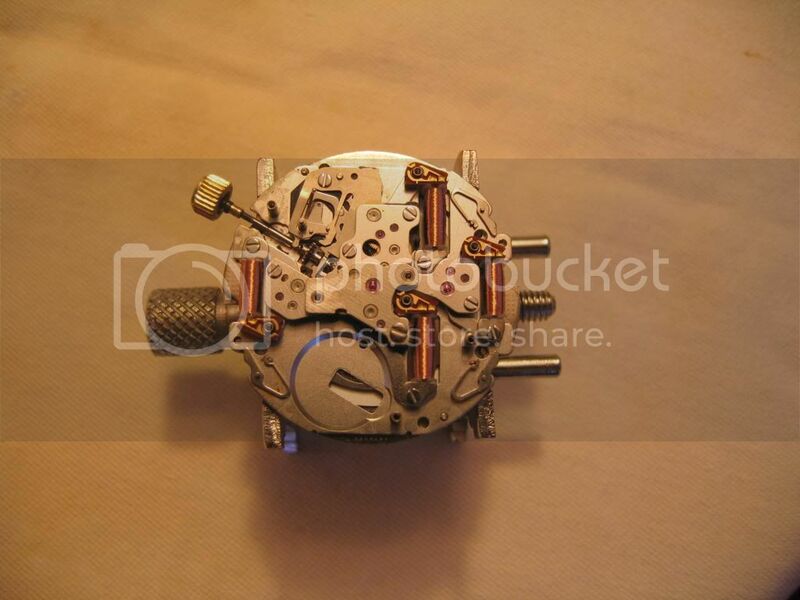 My curiosity is not great enough to disect the working watch with the notion of "if it ain't broke , dont fix it" . Although my curiousity is enough that I am looking for another 7Axx at the right low price to tinker with along with the donor . I have made an offer on one with an alarm. I also have other projects to finish first . BTW , I have been reading quite a few threads and links on this forum and appreciate the wealth of info it produces . Hi , update...I adjusted the changeover switch lever and all seems to be in order . Also as you had mentioned earlier, I looked at the PCB thru a loupe and did see stuff crossing the tracks...I cleaned it , adjusted the switch and BINGO...IT'S WORKING. Mahalo for all of your help and patience , Louis.